I don't know about you, but I'm starting to get anxious for Thanksgiving. I get so excited about the food and the get togethers...BUT mostly the decorating...and the food...Ok, it's a toss up...I'm actually planning my own Thanksgiving meal once again this year and was trying to come up with table decor ideas. As luck would have it, BloomNation contacted me about putting together some holiday table displays "me-style"with fresh flowers. BloomNation supports local florists through flower delivery services AND they showcase the florists' unique arrangements in BloomNation's online marketplace. I thought I'd share a few fresh flower arrangement ideas for to help get the creative juices flowing for your holiday table display. 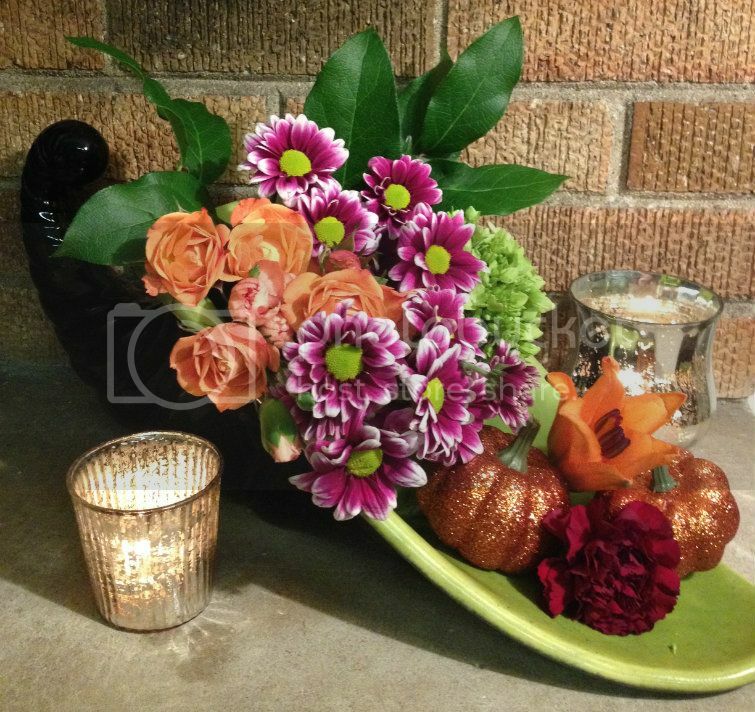 The first arrangement features interesting containers from around my house and various "autumn" colored flowers that I purchased from a local grocer. When choosing flowers for an arrangement, my rule of thumb is...if I think the colors look good together apart, then they'll probably look just as good grouped together. I am by no means a florist, so that's probably not how professionals do it, but...I don't have enough money to work with professionals. 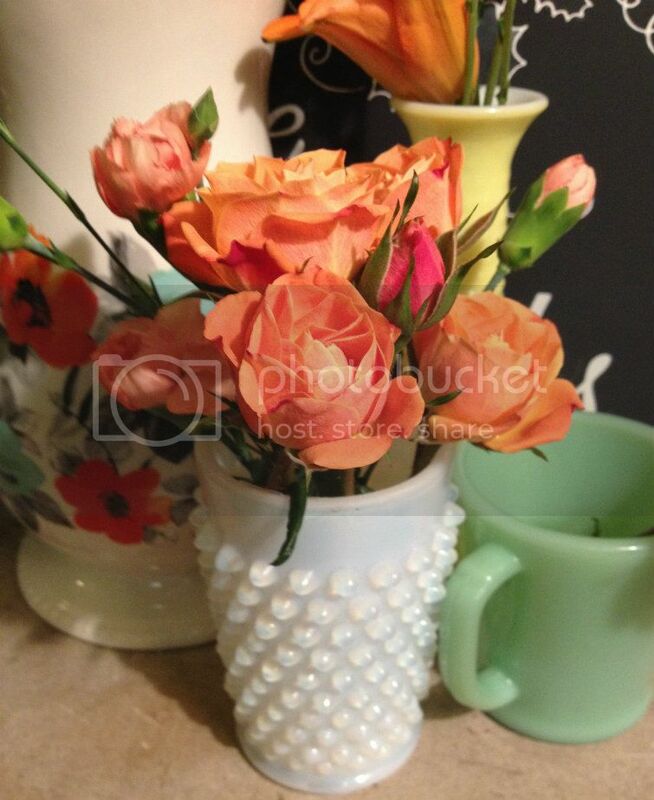 ;) I recently purchased the large pitcher new and matched it with a vintage yellow bud vase, a white vintage milk glass cup, and a vintage jadeite coffee mug to compliment the colors. 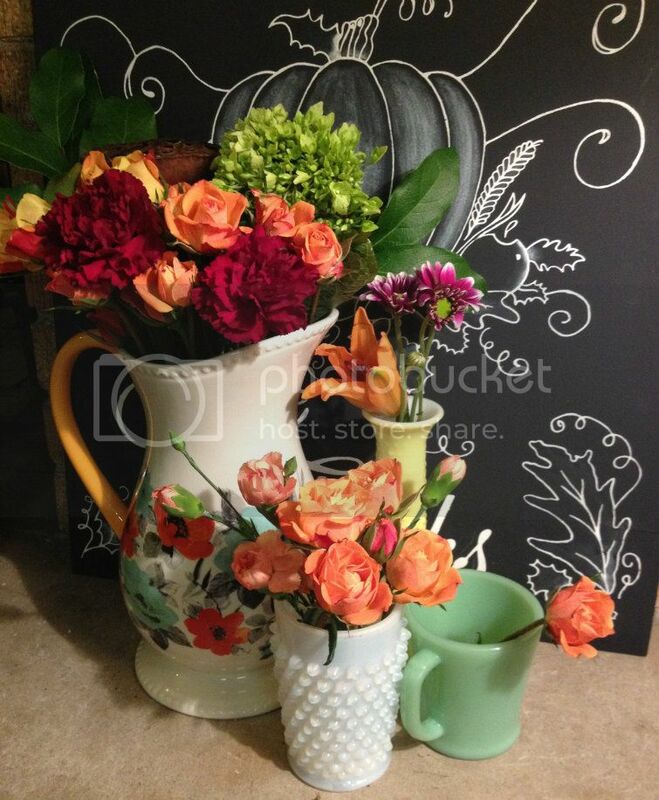 This arrangement is meant to be more "traditional" because it's a vintage cornucopia planter...Yes! I DO realize it's black and bright green...which is why I freakin' love it! I used some purple "daisy-like" flowers (like I said...NOT a professional) with bright green centers to accent the green in the planter. However, if you're going for a less flashy, more traditional themed event you can usually find horn of plenty baskets at any Goodwill or dollar store this time of year. Pair the basket with some orange, crimson, plum colored flowers and a few small pumpkins or gourds...Presto, you're all set! This one was a little tricky because I had to cut all of the flower stems to different lengths to get them to display correctly. To make arranging less stressful I always cut the little stems with the flowers on them off of the one giant stem they come on. It's so I can work with smaller flower clusters and trim their smaller stems depending on my arrangement. This was my kitschy kitchen themed arrangement. I'm sure many of you have a few cooking heirlooms (and / or colorful vegetables) around the house. Use them for your display this year! 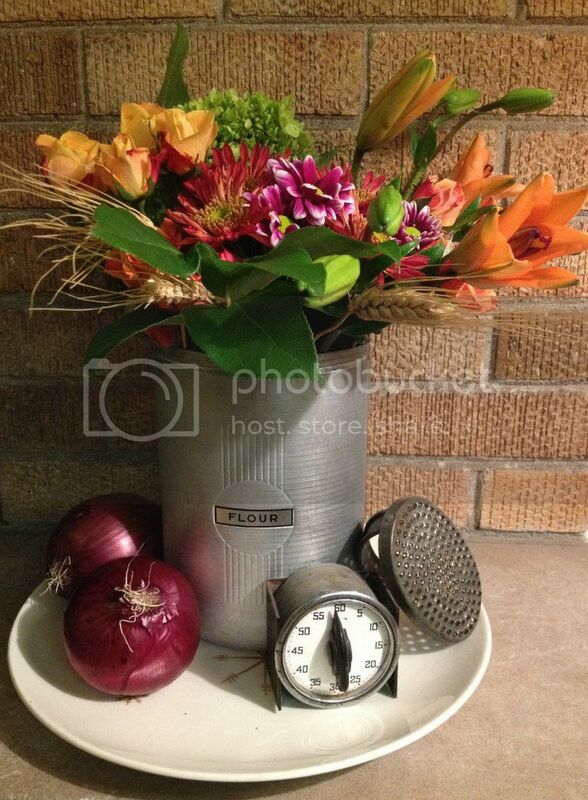 I used a vintage flour container to hold the flowers (ha!) along with my grandmother's kitchen timer and grater and a few red inions for a pop of color. Oh! And the platter is Star Glow. Of course, a Pyrex (or large) bowl of bright colored natural state veggies (like carrots, radicchio, bell peppers, and squash) would look fabulous as a Thanksgiving centerpiece. Ok, this one was meant to be my "flower minimalist / rustic" display....It looked so much better in person! 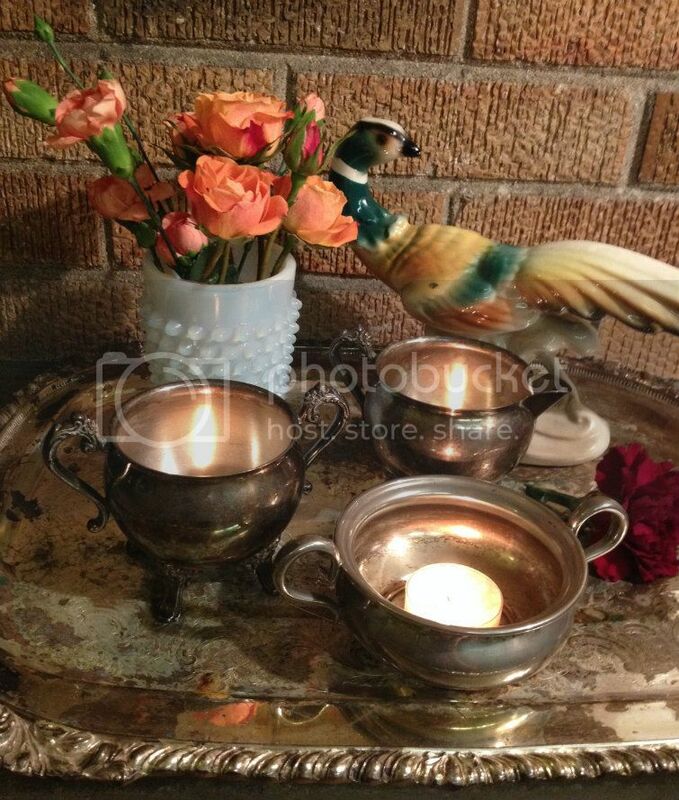 It's a beautifully tarnished silver platter (picked it up at Goodwill a few years ago) with a milk glass cup filled with a peachy rose spray, 3 mismatched tarnished silver cream and sugar bowls (also from Goodwill), tea light candles, and a vintage ceramic pheasant. I hope this helps inspire you to come up with an amazing fresh flower display of your very own this year!